Description:THE GRAND TOUR is a circus extravaganza set in the 1920s and featuring acts from the four corners of the globe. Ships, trains, automobiles, and airplanes will serve as the backdrop for breathtaking acts of wonder, accompanied by the seven-piece Big Apple Circus Band playing live at each of more than 200 performances. Acts will include clowns, jugglers, acrobats, and aerialists, from Africa, Asia, Australia, Europe, and North and South America, as well as domestic and rescue animals, all creating performances that will leave audiences smiling and cheering. Please click on a star rating for Big Apple Circus Presents The Grand Tour. 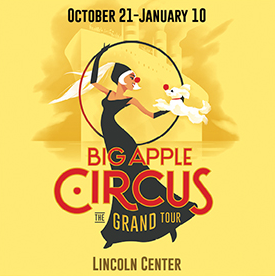 Please type your review for Big Apple Circus Presents The Grand Tour.